Ceviche is a dish with Latin American origins and consists of fish, and sometimes shellfish, that is ‘cooked’ by immersion in an acid such as lime juice or vinegar along, usually, with other seasonings. For a long time, my only experience with anything at all along these lines was with ‘Rollmops’ or other Northern European preparations of pickled herring and, since I love both of these, I was happy to get a chance to sample a version of the Latin counterpart at the Brasserie Metropolitain in Ottawa not long ago. This particular preparation surprised me a little as the fish (in this case, shrimp, tuna, salmon and scallop) were not served in a bath of the marinating liquid (as I expected from recipes and pictures I have seen) but was rather an arrangement of ‘dry’ chunks that had been removed from the marinade and served over ice. I now gather, however, that this is not particularly uncommon. The marinade was based on lime (I would prefer vinegar, myself) and it also contained cilantro. My wife, who has tried ceviche a number of times before, has generally disliked it because of the addition this herb but, while I am not crazy about myself either, I found it was used sparingly enough in this instance that it did not spoil my enjoyment. One criticism I had was that the ingredients were very unevenly cut and thus the marinade had different effects. The salmon was cut very thickly and was still a little raw in the center (although I didn’t mind this) but the tuna was in very small pieces and was ultimately a little bitter through ‘over-cooking’ in the acids. The shrimp and scallops both had a cooked texture and, while the scallops had a lovely sweet taste, the shrimp flavor was rather unremarkable. Should I make this dish sometime (assuming being able to buy fresh rather than frozen fish) I will be sure to pay close attention to the size of the pieces and relative ‘cooking’ times. 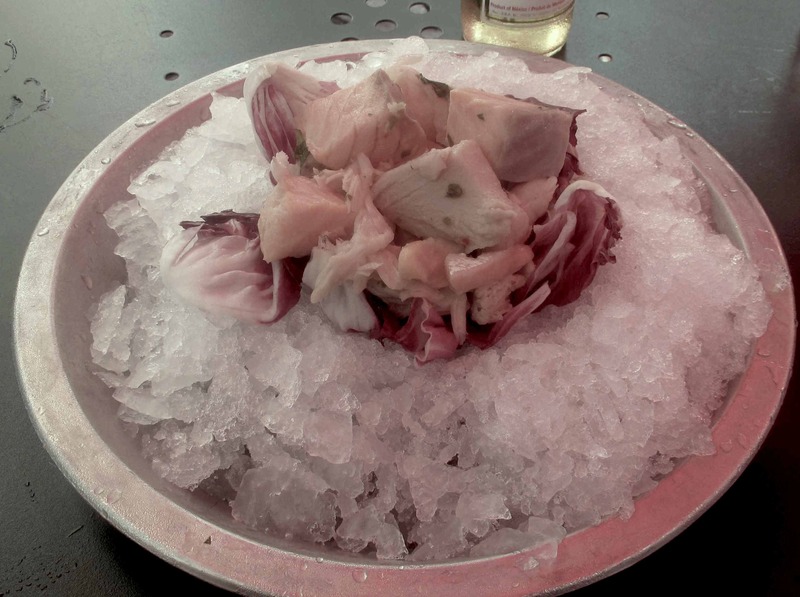 Having been raised in Peru, I love ceviche–never had it served on ice though. I’ve had a lime marinade (Peru) and a lime-tomato marinade (Ecuador), both are good. Seviche is hot (red peppers) and often served with a cooked sweet potato (served room temperature) to cut the heat. Nobody does ‘raw’ fish like the Japanese. I love the idea of ceviche. I have never had it. I’m going to try making it when I can get decent fresh fish.